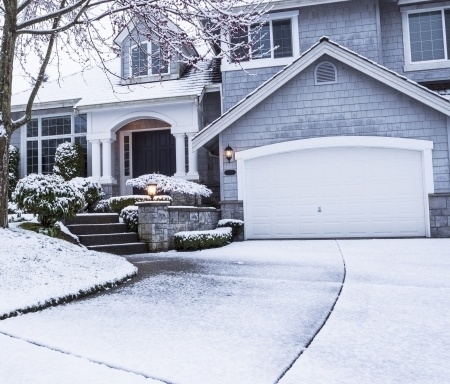 Is Your Garage Door Winter-Ready? With cold weather looming ahead, many homeowners begin winterizing their homes to settle down in their warm, cozy sanctuary for the next few frigid months to come. The frequently, overlooked garage door should be one of the top priorities when preparing your home for the upcoming winter months. For many people, the garage door is their primary source of entry to their homes, therefore it is essential that it is functioning at all times. The harsh months of the winter and the below-freezing temperatures that accompany them put a great deal of stress on garage doors, but there are numerous precautionary steps you can take to keep your garage door running smoothly throughout the winter. We here at Philadelphia Garage Doors have collected some tips to help you ensure your garage door will be ready for the winter. Because the garage door is usually the biggest entryway into the average home, it is especially important to ensure your garage door is properly sealed and functioning during the winter. Failure to do this can lead to freezing drafts throughout the home, and a steep increase in your home’s energy bill. Fortunately, it is not that difficult to see for yourself if you need work done on the sealing and weather strips of your garage door. All you have to do is simply turn the lights out in your garage with the door fully closed, and check if you can see any rays of sunlight seeping through any cracks or gaps along the garage door. If you don’t see any flaws then great, but if you do happen to notice some things that need help, one of our technicians here at Philadelphia Garage Doors will work with you immediately to ensure that your garage door is up to par for the winter. After the basic inspection it’s time take a more in-depth look at your garage door. Check to see if any screws are missing, check the condition of any hinges as well as cables. You should be looking for any rust or damage to these, as it can result in your garage door not functioning properly. Be sure to check the door tracks as well and clear off any dirt or debris as that can be detrimental to the performance of the rollers and the door itself. You can actually purchase track and roller and track lubricant to ensure that everything stays lubricated and functions properly during extreme winter weather conditions. One of the most frequent calls we get are for garage door spring replacements, and the cold weather can have a huge impact on the performance of your springs. Our garage door technicians at Philadelphia Garage Doors are on call 24/7 to assist you with any garage door services you may need. Even if your spring breaks at 5:00 am on a Sunday, a technician can still be there immediately to repair your spring and let you continue with your busy day. It is very easy to injure yourself trying to work on a spring or cable on your own due to the high amount of tension and pressure behind them. They can actually snap out and fatally injure anyone on the other end, which is why it is best to leave that type of job to a professional. Another major aspect of garage door preparation that most people fail to realize is the potential risk of power outages in the winter due to inclement weather. You should always be prepared for power outages, especially if you use your garage door as the main point of entry to your home. A power outage will cut off the power supply to your garage door opener leaving you and your family stranded outside with no way to get into your home. To prepare for outages you have a few options. You can get an emergency generator for your entire home, you can get a back-up battery pack that supplies power to your garage door opener only, or, you can simply make sure you carry a key with you during the winter months to guarantee that you’ll have a way into your home other than your garage door if the power were to go out. When it comes to your home, it is always best to be proactive. Luckily, if you keep your garage door well maintained there will not be much that needs to be done to get it winter-ready. If you do find that you need assistance with your garage door before winter hits, or any time at all actually, you can give us a call at (215)220-2348. Our friendly, customer-service associates are on standby 24/7 to assist you any time you may need service and will be more than happy to arrange an appointment for you with one of our garage door specialists.